The Deutsch-Amerikanisches Zentrum James-F.-Byrnes Institut Stuttgart, or German-American Center, will host its sixth annual “American Days” May 14-25. The program will feature more than 50 events such as lectures, exhibitions, music, concerts, movies, workshops and sports. The German-American Institutes in Heidelberg, Tübingen and Freiburg will also participate. 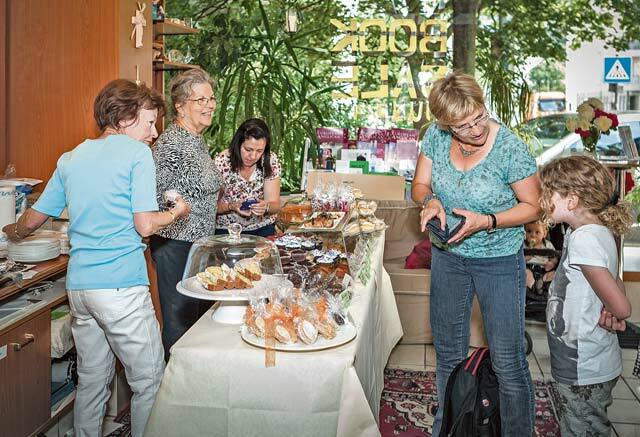 Visitors purchase baked goods at the St. Catherine’s Anglican Church book and bake sale during the last “American Days” in Stuttgart. This year, the sale will be held May 17 from 9:30 a.m. to 5 p.m. Patrons can find an array of English books and can also indulge in baked goods and coffee. American Days were established in 2008, and the idea is to provide information about the U.S. and its diversity to the public, according to Christiane Pyka, director of the German-American Center Stuttgart. “The American Days offer a platform to approach the U.S. in different ways and to learn about and educate patrons on the country,” she said. “During the American Days we also celebrate what we have here in Stuttgart when it comes to German-American interaction and everyday life: international companies and the U.S. military,” she added. The program is designed for all age groups and events are held in German, English, or in both languages. American Days will kick off at the Theaterhaus Stuttgart May 14 at 8:15 p.m. with a concert and performance by Gayle Tufts, an American musician and comedian living in Berlin. Tufts is popular for her musical performances, stand-up comedy and “Denglisch,” where she mixes German and American words for some interesting expressions. A German-American Gospel Concert will be held May 4 from 5-7 p.m. at the Leonhardskirche (Leonhardsplatz 26, 70182 Stuttgart). The Panzer Gospel Choir, along with German gospel choirs, will perform. The concert is free, however donations will be accepted for charitable projects. The Stuttgart Reds baseball team will host a baseball clinic May 15 from 5-7 p.m. for children 8-12 years old at the sports club Cannstatt, located near Robinson Barracks at Am Schnarrenberg 10, 70376 Stuttgart. Additional clinics will be held May 19 at 5:30 p.m. and May 22 at 5 p.m. Instruction is in German. Participants must register five days prior by emailing Markus Weil at weil@stuttgart-reds.de. The German-American Artist Group Stuttgart, a consortium of German and American artists, will open an exhibition at the Deutsch-Amerikanisches Zentrum May 16 from 7-9 p.m. The exhibition will run until June 6 and can be viewed Tuesday to Friday from 9 a.m. to 1 p.m., and 2-5 p.m. The DAZ is located at Charlottenplatz 17, 70173 Stuttgart. “US Rails,” an acoustic folk rock group from Philadelphia, Pa., will play at the Laboratorium Club (Wagenburgstrasse 147, 70186 Stuttgart) May 16 at 8:30 p.m. Tickets cost €14 and can be purchased online at www.laboratorium-stuttgart.de, or at Laboratorium the night of the event. St. Catherine’s Anglican Church (Katharinenplatz 5, 70182 Stuttgart) will host a book and bake sale May 17 from 9:30 a.m. to 5 p.m. Visitors can find a variety of English books and a selection of children’s books. Proceeds will go to the church’s charity projects. For the first time ever, the Wilhelma Zoological and Botanical Garden in Bad Cannstatt will participate in American Days and offer a “Wild, Wild West” tour May 17 from 11 a.m. to 12:30 p.m. North American plants and animals, such as mammoth trees, sea lions, rattlesnakes and bison and will be highlighted. The tour is in German. Those interested in attending must register by May 16 by calling civ. 0711-540-20. A tour will also be held May 21 from 4-5:30 p.m.; register by May 20. The Stuttgart German-American Community Chorus will perform May 18 from 6-8 p.m. at Bad Cannstatt’s “Kursaal” concert and event center (Königsplatz 1, 70372 Stuttgart). Tickets cost €12 and can be purchased by calling civ. 07146-90125 or online at www.sgacc.de. The Corso Cinema International movie theater in Vaihingen (Hauptstrasse 6, 70563 Stuttgart) will show “Hunger Games” exclusively for high school students May 20 at 2:30 p.m. The screening will be followed by a discussion in English. Tickets cost €5. Students must register until May 19 at www.corso-kino.de. A photo exhibition titled “Diverse Perspectives” will open at the Stuttgarter Künstlerbund Cafe (Schlossplatz 2, 70173 Stuttgart) May 21 at 8 p.m. Six American photographers living in the greater Stuttgart area will display their works until June 28. Tickets for the American Days opening event with Gayle Tufts can be purchased at the Theaterhaus Stuttgart, www.theaterhaus.com. The Theaterhaus Stuttgart is located at Siemensstrasse 11, 70469 Stuttgart. For more information and events, visit www.americandays.org.